It caps a magnificent March for the Clayborners, who have won all five matches, including a 3-2 extra time win over Hallam in the NCE League Cup quarter-final. Liversedge’s impressive run also saw them keep clean sheets in all four league games, as they won 2-0 away to Goole, 1-0 at Harrogate Railway Athletic, 1-0 at home to Bridlington Town the previous midweek and 1-0 against Thackley last Saturday. February’s player of the month Mason O’Malley scored the only goal of the game after 77 minutes and the recent good run has seen Liversedge climb to 13th to the table. They will look to continue their fine form with the reverse fixture at Thackley this Saturday. Sedge have been handed a League Cup semi-final at home to Division One side Swallownest. The tie will take place on Tuesday April 30, with Hemsworth Miners Welfare facing Premier Division leaders Worksop Town in the other semi-final. The NCE League Cup Final will take place at Doncaster Rovers Keepmoat Stadium on Monday May 13. 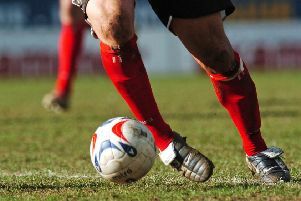 Liversedge’s development squad booked a place in their cup final on Monday night after defeating Campion Under-21s 2-0. Watching first team manager Jonathan Rimmington was pleased with the siodes’ performance, saying: “There were some very good performances, some great young talent and I can honestly say the fight and desire plus talent of these lads will definitely push them towards first team football .